VIP includes: Fast track entry to the festival, luxury toilets (not portaloos), bespoke bar, bespoke food concessions, sound system and DJ's, seating area. 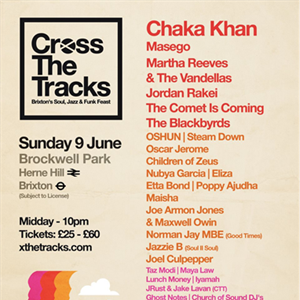 Cross The Tracks, brand new one day festival is coming to Brixton's luscious Brockwell Park, on Sunday 9th June for a day of music, street food, workshops, talks and more. Expect a mixture of legendary and upcoming artists representing a hybrid of jazz, soul and funk, over 40 of London's most talked about street food traders, alongside the city's finest craft beer brewers.